Justified Season 6 will be its last: How should it end? 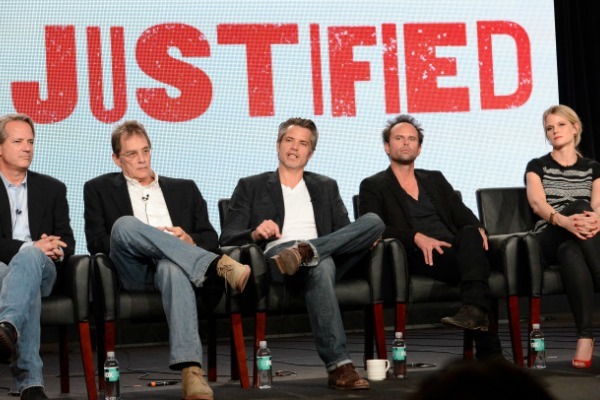 The team behind FX’s hit series Justified has announced that Season 6 will be its last. We’ve got a list of five ways the show could end. Fans of Justified were saddened to hear the news that the people behind the series have announced that next season will be its last. The series is currently in its fifth season and seems hotter than ever. Why end the show so soon? Executive producers Graham Yost, Michael Dinner and Timothy Olyphant (who is also the star of the show) said that the decision was made due to a couple of factors. At this week’s Television Critics Association press tour, Dinner said that part of it came down to figuring out how much story they had left. He said one of their biggest concerns has been running out of stories or repeating themselves. After so many seasons, some people might think it would get easier to keep it going, but Dinner admitted that the opposite was true. Often, they find themselves in the writers’ room turning down ideas because they’ve discovered that either a certain type of story won’t work or they’ve already done that story. In the end, it was a simple decision. “It really felt, in terms of the story of Raylan Givens in Kentucky, that six years was right,” Dinner said. Now that we know that Justified will end after next season, the question is this: How will it end? We’ve come up with five possible scenarios. Raylan and Boyd (Walton Goggins) have had a complicated (to say the least) relationship going all the way back to the first season, but at its core, their relationship is simply that of lawman and criminal. Currently, their paths aren’t crossing on the show, but having seen what Boyd is willing to do to get Ava out of jail, it’s not a stretch to imagine the two of them coming to a confrontation that ends with Raylan taking Boyd out to prevent (or perhaps avenge) a crime. Justified isn’t a show that has “happy ending” written all over it, and having the hero killed — especially by a man who was once his friend — wouldn’t be too much of a stretch of the imagination. It is easy to see how the two of them could end up in a battle to the death, and as they are equally matched in wits, the outcome of such a match isn’t necessarily set in stone. It’s entirely possible that Boyd could kill Raylan, perhaps even in a situation that takes them both out. On the show, Art (Nick Searcy) has made it pretty clear that he’s ready to retire soon, and undoubtedly, dealing with Raylan has made him think about doing it faster than he originally intended. Raylan may not seem the type to take over such a position, but it’s possible he could be persuaded if the circumstances were right. He could find a new love and decide to settle down, or he could even come to the conclusion that he doesn’t want to leave his new baby fatherless and that he should therefore take a less dangerous position in the marshals. Who said Justified can’t have a happy ending? Oh yeah, that’s right — we did. But though the show isn’t known for cheerful storylines, who’s to say that a happy ending is impossible? Raylan has been through a lot in the past few years, and who knows how much more he will go through once the show is over? By the time Season 6 comes to an end, he could make a life-altering decision to give up the violent life of a marshal and just be a father to his baby girl. If we’re giving Raylan a happy ending, we might as well give Boyd and Ava (Joelle Carter) one, too. Sure, they’ve done a lot of terrible things in their lives, but much of what they’ve done has been in the name of keeping each other safe and happy. Since Boyd fell for Ava, his entire life has revolved around her, and we know he will stop at nothing to get her out of prison. After she is free, perhaps they will ride off into the sunset and live happily ever after, leaving their criminal past behind them. How do you think the Justified series finale should end?